Ginger is sometimes used with cinnamon, but this zesty spice can certainly hold its own. Ginger plants have a rhizome, or a stem that grows horizontally under the ground, and this is the part of the plant that is edible. Like many spices, ginger dates back many centuries as a medicinal spice, primarily to treat gastrointestinal symptoms. It originated in Asia and has been used in Chinese, Japanese, Indian, and Middle Eastern medicine. Ginger is known in herbal medicine circles as a carminative, or a substance that helps to alleviate (ahem) gas, as well as aspasmolytic, or something that helps to relax the muscles of the intestines. Double-blind studies show that ginger is actually better than over-the-counter medicine for relieving the symptoms of motion sickness (especially seasickness) such as dizziness, nausea, vomiting, and sweating (good to know for anyone embarking on a cruise this winter!). Ginger may help with nausea associated with chemotherapy, as well. If you know anyone who is pregnant and dealing with morning sickness (technically called hyperemesis gravidarum), you might point her in the direction of ginger root. Research shows that ginger is safer and more effective than antinausea drugs in relieving the nausea and vomiting of pregnancy. Not bothered by motion sickness? Not pregnant? Ginger might still be of help to you. Due to its potent anti-inflammatory compounds called gingerols, ginger can help relieve the pain of arthritis by suppressing inflammatory substances that attack the cells in joints. And since all of us are at risk for both the regular and H1N1 flu this season, we’d be wise to consume some ginger, either by eating fresh ginger root or drinking ginger tea. Ginger stimulates the body to sweat more, which, in turn, protects the body from harmful bacteria and viruses (and doesn’t the thought of a hot cup of ginger tea when you’re not feeling well sound good?). Ginger may possibly lower blood glucose levels, but this doesn’t seem to be a primary action of this spice. However, ginger may lower blood pressure, and it may interfere with blood clotting, so anyone taking aspirin or other blood-thinning medicines should be aware of this. Also, anyone with ulcers or inflammatory bowel diseases, such as Crohn disease, should use ginger with caution. Too much ginger may lead to heartburn, GI distress, or diarrhea. Ginger root. Whenever possible, use fresh ginger root, which is readily available in the produce section of your supermarket. Fresh ginger root contains higher levels of gingerols. You’ve probably seen it — it looks like a tan, knobby, twisted root. Choose fresh ginger that is smooth and firm, and store it in your refrigerator. To use ginger root, peel off the skin and then slice or dice the root. Add fresh ginger to stir fry dishes, vegetable dishes, salad dressing, or soup. Just remember that this spice can be quite pungent, so go easy with how much you use. To make ginger “tea,” pour boiling water over a few pieces of ginger root and let the tea steep for several minutes. Remove the ginger pieces and add sweetener, if desired. For an extra kick, add some cinnamon sticks while the tea is steeping, and remove before drinking. Dried ginger root. Dried ginger root is available as slices of fresh ginger that have been dried. It should be soaked in liquid before use. Dried ginger powder. Most of us probably have a small can or jar of powdered ginger in our spice cupboards. A quarter teaspoon of ginger powder, or ground ginger, is equivalent to 1 tablespoon of grated fresh ginger. 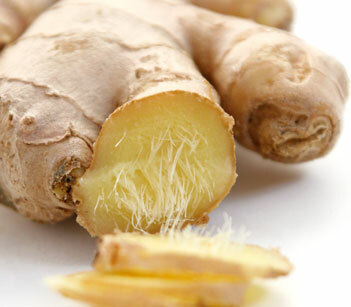 Always store ginger (and other spices) in a tightly capped container, away from light, heat, and moisture. Dried ginger will last about one year in the refrigerator. Crystallized ginger. Crystallized ginger is a real treat. This is ginger root that has been cooked in syrup and coated with sugar. One ounce of crystallized ginger contains about 95 calories and 25 grams of carbohydrate. Pickled ginger. This form of ginger is usually pink or red, and has been pickled in vinegar. It often accompanies sushi dishes. Ginger supplements. Ginger also comes in tablet, capsule, or liquid form as a dietary supplement. Some sources cite 4 grams of ginger per day as the maximum recommended dose.